Native Americans have had Bannock cooking over a campfire for many many years. It's now becoming popular with campers. 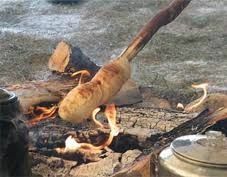 Prepare a favorite bannock recipe, bake in an oven or divide the dough into egg sized lumps and firmly wrap each lump around the end of a four foot stick. Prop the stick securely over the fire until golden brown. Turn the stick to cook the bread evenly. Native Americans have had Bannock cooking over a campfire for many many years. It's now becoming popular with campers. Prepare a favorite bannock recipe, bake in an oven or divide the dough into egg sized lumps and firmly wrap each lump around the end of a four foot stick. Prop the stick securely over the fire until golden brown. Turn the stick to cook the bread evenly. 1. In a medium sized mixing bowl, mix the flour and butter together by hand. 2. Add the baking powder, salt and raisins, if desired. 3. Add milk and work the ingredients into a dough. To cook over a camp fire, divide the dough into egg size lumps and firmly wrap each lump around the end of a four foot stick and prop securely over the fire until golden brown. To cook in an oven, spread the dough out into a 16" square cake pan. Bake at 425 degrees F for about 20 minutes or until golden brown. And enjoy!